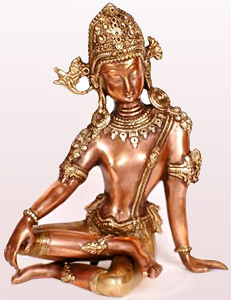 Lord Indra is the king of the cosmic gods, according to our mythology. On the one hand, according to tradition, he is most powerful. On the other hand, because he makes mistakes, he does not remain fixed in his own transcendental height. The so-called modern world is not guided or shaped by Indra. Very little of his influence do we see today. Only people who have studied Indian mythology and have consciously established some inner oneness with the great Indra feel his influence. Otherwise, none of the cosmic gods guide or mould humanity. Only those who have aspired to establish a conscious oneness with the Indra consciousness will receive from Indra. It is the same with the Buddha consciousness, the Krishna consciousness or the Christ consciousness. Indra has not taken human form, so sometimes we have to use our mind to imagine him. Imagination is a reality, true. But afterwards, the mind makes the entire being feel that it is nothing but sheer imagination. We can approach the Indra consciousness sincerely and devotedly. But after we approach the god with our mind, then no matter what reality we establish or see, we doubt it. We call it imagination. Just because of the mind, we call that reality imagination. When we call it imagination, we weaken the mind-reality itself. So Indra, for some people, is only a mental fabrication. But for other people he can be a cosmic god who arouses dynamism in us and in others so that ignorance can be conquered, especially on the vital plane. In the Vedas, he was approached not on the mental plane but the vital plane. He has a dynamic, warlike spirit. Indra is the one who gives dynamic spirit to those who consciously need it. You can try to approach the dynamic spirit that exists either in Indra or in any other cosmic god or in the Supreme Himself. Through Indra, one can go to the highest dynamism, but it is very difficult. But if you do not know Indra, no harm. It is easier if you know someone on earth who possesses that dynamic quality or capacity. It is very difficult for people to approach the highest Absolute Supreme. But if you see someone in the physical or vital form who embodies the capacity of dynamism, then it is infinitely easier for you to reach that quality. The modem world, by nature, is not lethargic. It is dynamic; destructive, you can say. But when it is resting with one part of its being, it has a sincere appreciation of dynamism. Someone knows what he needs, but he does not do it because the thing that he needs demands some exercise and personal effort. So the modem world, which actually needs dynamism, can get it through Indra if the modern world actually knows Indra’s capacity. Again, if one does not know who Indra is or what Indra’s function is, then he can invoke the power itself or dynamism as such.